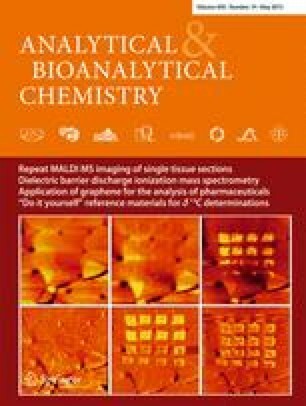 Herein, we represent a simple method for the detection and characterization of molecular species of triacylglycerol monohydroperoxides (TGOOH) in biological samples by use of reversed-phase liquid chromatography with a LTQ Orbitrap XL mass spectrometer (LC/LTQ Orbitrap) via an electrospray ionization source. Data were acquired using high-resolution, high-mass accuracy in Fourier-transform mode. Platform performance, related to the identification of TGOOH in human lipoproteins and plasma, was estimated using extracted ion chromatograms with mass tolerance windows of 5 ppm. Native low-density lipoproteins (nLDL) and native high-density lipoproteins (nHDL) from a healthy donor were oxidized by CuSO4 to generate oxidized LDL (oxLDL) and oxidized HDL (oxHDL). No TGOOH molecular species were detected in the nLDL and nHDL, whereas 11 species of TGOOH molecules were detected in the oxLDL and oxHDL. In positive-ion mode, TGOOH was found as [M + NH4]+. In negative-ion mode, TGOOH was observed as [M + CH3COO]–. TGOOH was more easily ionized in positive-ion mode than in negative-ion mode. The LC/LTQ Orbitrap method was applied to human plasma and three molecular species of TGOOH were detected. The limit of detection is 0.1 pmol (S/N = 10:1) for each synthesized TGOOH.